Adventures In Uglyworld: Uglyworld #296 - I Can't Find The Car! Uglyworld #296 - I Can't Find The Car!, originally uploaded by www.bazpics.com. 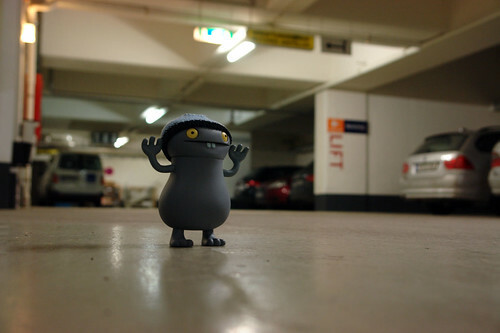 This morning while everyone finished off packing their cases we sent Babo down to make plenty of room in the car for everything, Jeero went along too after Babo's last escapades in the carpark and decided to take the camera with him to capture any madness that went on. Babo hunted high and low for the car and couldn't find it, Jeero said he would make fun of this every so often to provoke a reaction from Babo (like the one he captured here). Eventually Jeero decided to point out where the car was hiding, to which Babo replied, "Did you just put that there?". Jeero laughed about this the whole way back to Aachen tonight (wooohooo, we're home at last!!! ).